The word skeleton sounds very significant, and indeed humans could not exist without a skeleton! Similarly, a cellular skeleton or cytoskeleton is crucial for the functions of a cell. Several different types of cytoskeleton have been identified that are necessary, for among other things, muscle movement and the activities of the brain, and consequently humans could not function at all without cytoskeletons. This also means that a number of diseases are connected with defects in cytoskeletal elements, and various chemotherapies that are presently used to treat a variety of tumors aim to impair the functions of cytoskeletons. Inasmuch as cytoskeletons play a crucial role in the actions of cells and of the human body, and considering that modulation of the activities of cytoskeletons is essential for the treatment of patients, the finding of a novel cytoskeletal element should open up a new area of research—a new scientific world! Fig. 1. (A). A modified version of the image presented in (B) illustrating the unknown aspects of finding a novel cytoskeletal element. 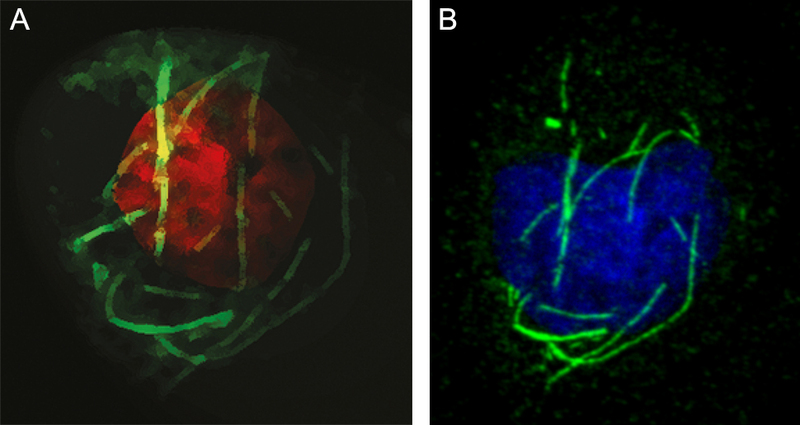 The image shows the cytoskeleton formed by gamma-tubulin (green) and the genome of the cell (red). (B). Image of a cell from a bone tumor showing the cellular skeleton composed of gamma-tubulin (green) and the genome of the cell (blue). A hallmark of various cytoskeletons is the ability to rapidly grow or shrink in response to environmental factors. Fulfillment of this capacity involves a range of proteins that regulate and aid the mentioned changes. One of these cytoskeleton-assisting proteins is gamma-tubulin, which is related to a group of proteins that create a cellular filament called a microtubule. A living cell contains a large number of such filaments, which together form a cytoskeleton designated microtubules. During cell division, the microtubule cytoskeleton guides the genome to ensure that each offspring cell ends up with a single set of the genome. Disruption of this microtubule-dependent step in cell division is used as a strategy to kill tumor cells. Gamma-tubulin was recently found to be the major component of the cellular filament, called a gamma-tubule. In contrast to the homogeneous cytoskeleton composed of microtubules, it appears that the cytoskeleton consisting of gamma-tubules differs from cell to cell. The exact functions of gamma-tubules as novel skeletal elements are not fully understood. Nonetheless, no species have been found to lack gamma-tubulin, and depletion of this protein in living cells causes immediate cell death. Accordingly, gamma-tubulin is considered to be essential for life. Due to its vital functions, gamma-tubulin is related to several human diseases. Mutations in gamma-tubulin are associated with lissencephaly and microcephaly, two of the most common brain malformations that can underlie mental retardation and neurological morbidity in children. Also, the level of gamma-tubulin is higher than expected in various tumors, and this elevation in gamma-tubulin coincides with the absence of an important anti-proliferative molecule called retinoblastoma (RB). RB is lacking in many different types of tumors, for example, cancers of the eye, brain, blood, lung and skeleton. Preventing the functions of gamma-tubulin in RB-devoid tumors triggers the death of tumor cells and thereby impedes tumor growth. Considering that non-tumor cells carry RB, knowledge of this tumor-preventing effect can serve as a basis for the development of novel treatments that have fewer side effects. Consequently, knowledge of the gamma-tubulin cytoskeleton is necessary to highlight the potential functions of gamma-tubulin in life and in disease, and also to aid the search for novel strategies to kill tumor cells. Characterization of gamma-tubulin filaments in mammalian cells.